The Patriots stars kept things cool and classy with high-end wine, bourbon, barbecue—and an MVP-level photo with two top chefs. By Jacqueline Cain·	 2/6/2019, 12:29 p.m.
On Super Bowl Victory Parade Day, how did Patriots party king Rob Gronkowski and MVP Julian Edelman celebrate their shiny new rings? 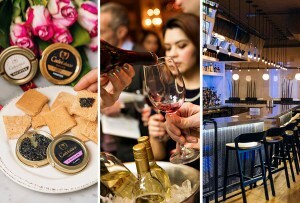 With some of the classiest wines and some of the hottest restaurant seats around Boston, of course. 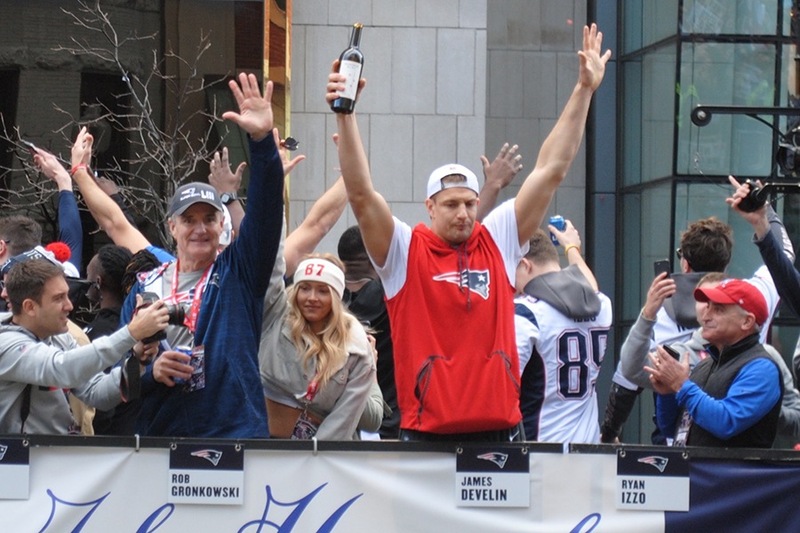 As is parade-route tradition for Gronkowski, the tight-end and party king definitely crushed a can or a few of Bud Light during his third Super Bowl parade (and the Pats’ sixth) on Tuesday. But local oenophiles were juiced to see Gronk also going hard on a Duck Boat with a high-end bottle of natural wine from Napa Valley producer Hundred Acre—which typically retails for more than $500. The Urban Grape co-owner TJ Douglas couldn’t tell which vintage Gronk was drinking straight from the bottle, but Hundred Acre wines “are fantastic,” he says. “Big, juicy, and yummy”—how some fans might describe Gronk himself, he adds, laughing. 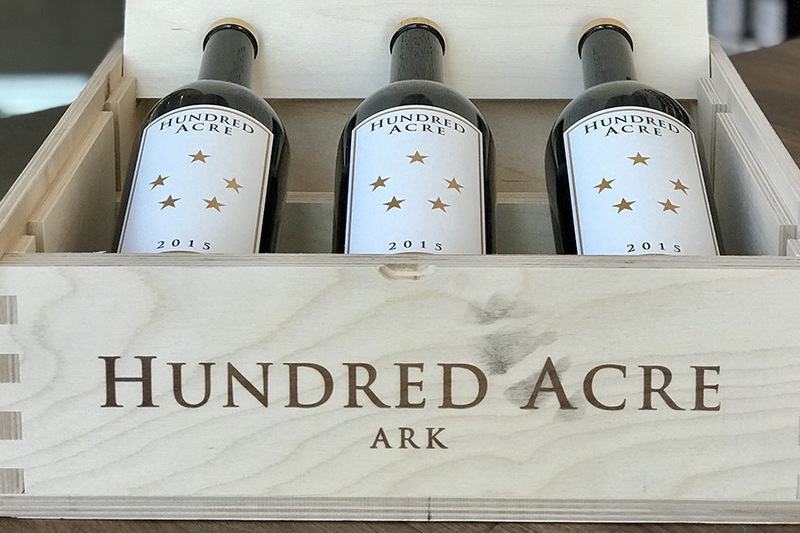 Today, the Urban Grape received a few bottles each of Hundred Acre ‘Ark Vineyard’ Cabernet Sauvignon 2015 (a Wine Advocate-rated 100-point wine), and ‘Kayli Morgan Vineyard’ Cabernet Sauvignon 2015 (99-point). But if the $525 price tag is out of reach, Douglas suggests another big-bodied bottle, the 2016 Obisidian Ridge Cabernet Sauvignon from Lake County, Calif. It’s priced at $32 at UG. After the rolling rally, Gronk took his appetite and entourage to the Smoke Shop BBQ in the Seaport. 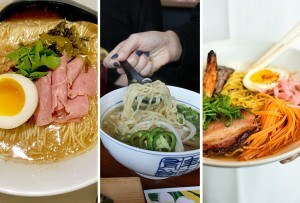 The tight-end ate dinner with his father, his girlfriend, the model Camille Kostek; his brother Gordie, and a few friends, says chef-owner Andy Husbands. 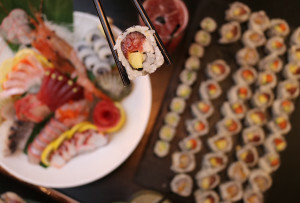 The crew feasted on a spread of Husbands’ award-winning barbecue and French fries, plus “a few baskets of tofu that they thought paired nicely with our cheese sauce.” No more wine here: Gronk favored bourbon cocktails and craft beers, Husbands says. Before he left the restaurant, Gronk hung out by the bar and took selfies with fans. 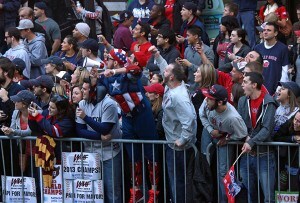 And how did MVP Julian Edelman wind down after the parade? Before posting up in a TD Garden luxury suite in a custom Bruins sweater to watch the home team beat the New York Islanders, No. 11 had dinner at Little Donkey. 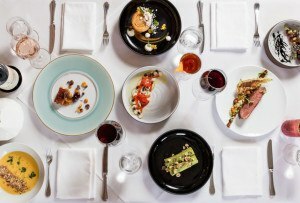 Ken Oringer and Jamie Bissonnette’s fun and flavorful small-plates spot in Cambridge is one of Edelman’s favorite local restaurants—and ours. Perhaps the mostly clean-eating burger lover got an early taste of the new Impossible Foods plant-based patty while he was at Little Donkey. Is it just us, or are there three MVPs in this photo?